Social Media is an ally for all the bloggers if used correctly. But while using social media for blog promotion one has to be constantly on toes. If you don’t mind being on the edge all the time, social media promotions are for you. As a beginner the whole social media promotion world can be daunting. Let us understand that using social media platforms is totally free, having said that there is a certain limitation on what personal information you are giving out to the social media platforms. Here are some things which you should consider before choosing a platform for social media promotion. Most bloggers do the mistake of being on all social media platforms, which is overwhelming both for the bloggers and for the readers. They do not know what to expect from you. So, choosing the platform which suits your blog posts is the wisest decision you can make as a blogger. How would you choose the platform? If you are a blogger who can whip up 140 words every now and then throughout the day and attract your readers through them, twitter is for you. For some it may prove to be daunting. Twitter is the most trending social media platform. It also helps to understand which hashtags are popular and you can frame your content accordingly. There is a huge blogger community on twitter which one can get connected to. Like Blogchatter, there are other platforms which conduct chat sessions which is worth joining. Twitter is very useful as a beginner, but you need to understand and find out your tribe. This is by far everyone’s favourite because of ease of use and the popularity among users. Facebook promotions are tricky. There are two ways to promote on Facebook. The first way is to publish a blog post link on a dedicated Facebook Account and the other way is to write a blog post on Facebook. But the problem with the other one is that it won’t get you the traffic. Though your Facebook account has millions of followers, until they drop by your blog site, getting the visitors is virtually of no use. So while promoting on Facebook, it is important to know what exactly you want from it. Facebook is amazing as it has many blogging tribes. You can always find your tribe and get traffic routed from there. Pinterest can not be completely called as a social media platform, it is a search engine and best at that. Choose Pinterest if your posts are mostly “How to’s” and helpful to people. Pinterest is the choice for Fashion, Craft, DIY bloggers but it is not limited to that for sure. Any genre can do well on Pinterest. You need to have an amazing sense of images to share it on Pinterest. And a lot of homework is needed to get going. In the forthcoming blog posts, Pinterest strategies for beginners will be covered. “If you haven’t grammed it, it hasn’t happened”, is one of the saying. As it promptly says, Instagram is more about being real. IGTV is one of the most watched platform on Instagram. If you are a fitness blogger, yoga blogger and the likes, Instagram is for you. Instagram audience prefers it real without many images. If you are ready to show your progress and strike a real conversation, it is the best place. Be careful to choose proper hashtags to amplify your presence on Instagram. All the platforms have different promoting strategies which we will discuss in our next posts. 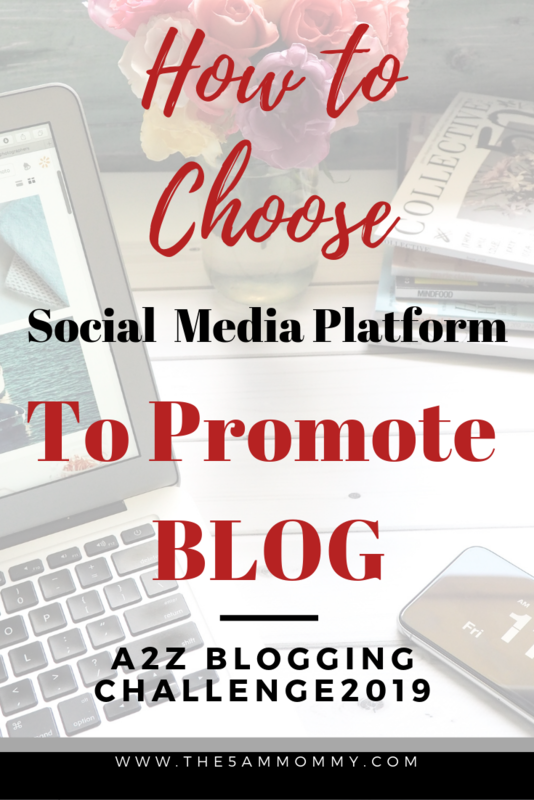 Which platform do you use widely and which platform gets more traffic to your blog? Drop in the comment. Wow that’s a must for any beginner like me. Thanks for the info. Interesting topic! looking forward to read all the related post!